Ebbsfleet, FC Halifax Town’s opponents on Saturday, go into the game on a bit of a low ebb, according to Steve Tervet, who covers the club for Kent Online. The Fleet have experienced a tumultuous season so far, winning four of their first seven games before only getting three points from two of their next 13 league matches. Manager Daryl McMahon, who guided the club to the play-offs last season, left on November 7, replaced by former Dagenham and Redbridge boss Garry Hill. Under him, Ebbsfleet are yet to score in his first three games in charge - 0-0 draws against Cheltenham and Boreham Wood, and a 2-0 defeat in midweek in an FA Cup first round replay at Cheltenham. “They’re solid in defence, OK in midfield but they’ve gone three games without scoring. They’ve missed good chances in each of them and the confidence of the forwards has taken a hit,” said Tervet, who explained the story of Ebbsfleet’s season so far. “Where do I start? They were probably among the pre-season title favourites having reached the play-off semi-finals in their first season back up, kept their squad together and strengthened. 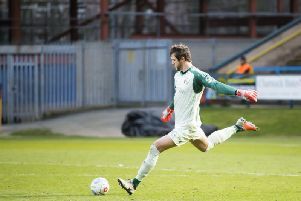 “They were looking good by the end of August despite a couple of home defeats but things went downhill in September, hitting a major low in the 4-1 defeat at Wrexham. It then emerged the players had been paid late seven times this year and reported late for the start of pre-season training because of it. Manager Daryl McMahon confirmed the story while the club announced a financial restructure which saw his assistant manager and first team coach leave the club as part of a major cost-cutting exercise. “The owner, Dr Abdulla Al-Humaidi, responded by saying McMahon’s wage budget was excessive and that there are far too many players at the club. McMahon left by mutual consent, just over 12 months into a five-year contract, with former Dagenham and Woking boss Garry Hill appointed the following day. “Three more coaches followed McMahon out of the club, leaving just Hill and his new assistant Ian Hendon on the staff (plus two physios). Hill needs to get players off the wage bill and Dave Archer - previously the general manager - has been appointed managing director to oversee the financial restructure on a day-to-day basis. Tervet says home form has been one of the biggest issues this season for Ebbsfleet, who have only scored the first goal in two of their 10 league games at Stonebridge Road. Tervet identified Myles Weston as Ebbsfleet’s dangerman. “He has been very good down the right wing, although he’s just come back from international duty with Antigua & Barbuda so might not start on Saturday. Tervet says there is a contrast between the tactical approaches of McMahon and Hill. Tervet says Ebbsfleet will hope to have centre-back Kenny Clark, who was on the bench at Cheltenham with a tight calf, back alongside captain Dave Winfield. “We’ll have to wait and see whether Weston and Adams (Gambia) play from the start after their long flights this week,” said Tervet. Tervet says Hill hasn’t made many changes in his first three games but suggested after the FA Cup replay he was ready to try something different.